I am going a little crazy with alignment in the tabular environment. 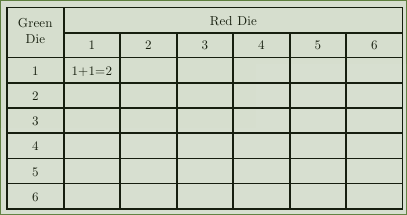 In the following code I would like both the top-left cell 'Green Die', and the last cell in the 2nd row '6' to be aligned vertically. I know the alignment issues with the cell '6' have to do with it being the last column, because if I make it the second to last column it is aligned in the middle. Not the answer you're looking for? Browse other questions tagged tables horizontal-alignment vertical-alignment columns or ask your own question.